It is with great sadness that the family of Thomas Franklin McDonald, better known as Tommy McDonald, announces his passing on Monday morning September 24, 2018. He was surrounded by his loving family at his daughter’s home outside of Philadelphia in Audubon, Pennsylvania. He was 84 years old. He was a local resident of King of Prussia, Pennsylvania since 1962 and also a member of Mother of Divine Providence Church. Tommy was a devoted husband of 55 years and a loving father and grandfather. Tommy was best known for his illustrious football career throughout high school, college, and then professionally in the NFL. After a successful high school career as a three-sport athlete at Highland High School in Albuquerque, New Mexico, he went on to the University of Oklahoma where he was a two-time All American in 1955 and 1956. As a Sooner half-back, he helped lead the two time National Champion Sooners in 1955 and 1956. While there, he was a team member of the undefeated OU Sooners, having never lost a college game in his four years, and is still today the record for major college football’s longest winning streak. He was also awarded the Maxwell Award as college football’s Most Valuable Player and placing third for the Heisman Trophy in 1956. Following college, the Philadelphia Eagles selected him in the third round, where he went on to have a successful 7 years with them. He helped them win the 1960 NFL Championship. 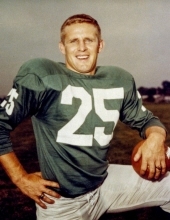 Tommy played five more years after the Eagles, for a total of 12 years on teams including, the Philadelphia Eagles, the Dallas Cowboys, the Los Angeles Rams, the Atlanta Falcons, and the Cleveland Browns. Upon his retirement with the NFL, he finished with six pro bowls and ranked sixth in NFL history in catches, fourth in yards, and second in touchdowns. One of his proudest moments in his NFL career was his induction into the NFL Hall of Fame in 1998. In addition to the NFL Hall of Fame, he was also inducted into the National High School Hall of Fame, Pennsylvania Hall of Fame, Philadelphia Hall of Fame, Oklahoma Hall of Fame, New Mexico Hall of Fame, and the College Hall of Fame. After his football career, Tommy ran a successful oil portrait and plaque business for over 40 years. His oil portraits and plaques are nationally known for the work he did in the MLB, NBA, NHL, and various colleges, businesses, and events, such as the Miss America Pageant and Heisman Trophy Winners. In addition to his outstanding professional career, Tommy McDonald should also be remembered for his dedication to the surrounding communities, genuine care for the ill and disabled, and helping others in need. Up until the very end, Tommy was an ambassador for the game of football, especially the Philadelphia Eagles and the NFL Hall of Fame. Born in Roy, New Mexico on July 26, 1934, he was the son of the late Clyde E. and Beulah (Proctor) McDonald. He was preceded in death by his wife of 55 years, Patricia Ann (Gallagher) McDonald, who died in January of 2018. He is survived by his brother, Clyde Ray McDonald and his wife, Eileen, of Albuquerque, New Mexico; his four children: Sheryl Capone and her husband, Rudy, of Audubon, PA, Christopher McDonald of Collegeville, PA, Thomas McDonald and his fiancée, Kathleen Brennan, of King of Prussia and Patricia “Tish” McDonald of King of Prussia; and five grandchildren: Andrew, David, Rhett, Kyle and Bradley McDonald. A public viewing for Tommy will be held at Mother of Divine Providence Church, 333 Allendale Rd., King of Prussia on Friday, September 28 from 4 PM to 8 PM. A private viewing will be held for immediate family and close friends on Saturday, September 29 from 9-10:15 am with Mass following at 10:30 am. Interment will be private. To send flowers or a remembrance gift to the family of Thomas F. McDonald, please visit our Tribute Store. "Email Address" would like to share the life celebration of Thomas F. McDonald. Click on the "link" to go to share a favorite memory or leave a condolence message for the family.